The Prime Minister of Malaysia, who took normal cronyist corruption and added several zeroes to the total. The president of the Philippines, because he announced to voters that none of his mistresses would be on the public payroll. The follicly-challenged President of France, Francois Hollande, who squandered more than $100,000 per year on a hair stylist. As a proud American, I was chagrined that no Americans made the list. So I’m delighted to report that our first contestant in the 2018 race is from the United States. Courtesy of the Washingtonian, let’s look at a very strong candidate for this year’s award. Parking laws in the District can seem like a mess, but as any DC driver can note, confusion is not an excuse for breaking the law—unless you’re DC Councilmember Jack Evans. Evans, whose free-form approach to parking regulations has been well-documented, was spotted in his car Saturday morning, idling in a no-parking zone in Georgetown… Evans is hardly the first member of the DC Council to be criticized or spotlighted for flouting the District’s traffic and parking rules. …But of all of these, Evans is the council’s best-known parking-law skeptic. As it turns out, he has a point: In 2002, the DC Council granted itself the same legal immunity that members of Congress enjoy in the District, allowing them to park in bus zones, crosswalks, and residential permit zones when on official city business. But the mere fact that there are special rules for insiders isn’t what qualifies Mr. Evans for an award. If that was the case, the folks on Capitol Hill would deserve an award for wanting exemptions from the Obamacare law that they imposed on the country. Or we could give a giant prize to the bureaucrats at the OECD, who get tax-exempt salaries while pushing higher taxes on the rest of us. What makes Mr. Evans worthy is the remarkable logic that he used when confronted by a lowly voter. Kmetz says he first noticed Evans’ car parked at the corner of 32nd and Q streets, Northwest, while on his way to the post office. …Kmetz approaching Evans and asking the councilmember if he knows he is parking illegally. “Can I ask you something? Why do you care?” Evans responds. “Because if I parked illegally, I would get a ticket,” Kmetz says. “If I park illegally, that opens up a spot for you,” Evans says. But I’m wondering if Mr. Evans missed a golden opportunity. Instead of being snarky, he should have expressed fake empathy and told Mr. Kmetz that he would “solve” the problem the by submitting a bill to provide chauffeur-driven limousines to all members of the DC Council. And he could even demonstrate his “frugality” by buying second-hand limos from the federal government’s massive fleet. P.S. 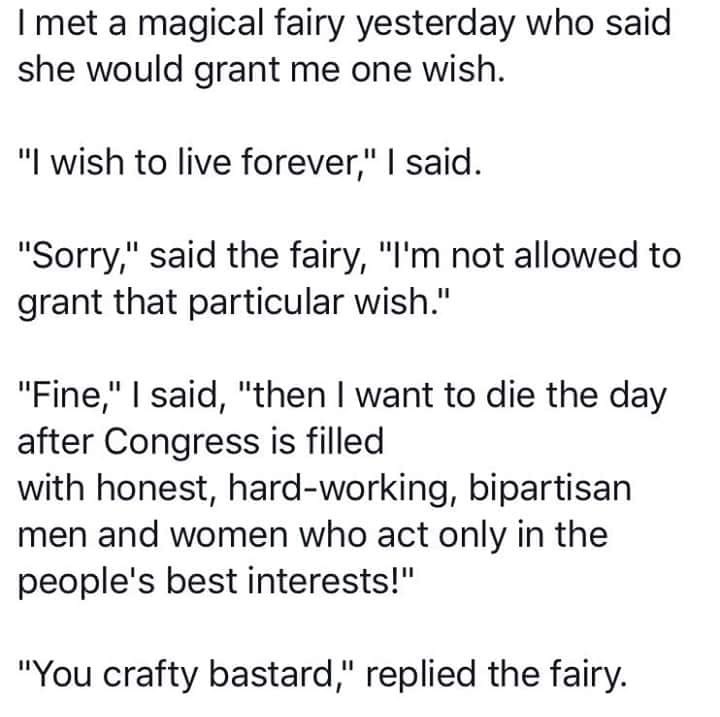 Since I’m mocking politicians, here’s an amusing joke that a reader shared with me. Though I would amend the joke by removing “bipartisan.” As we saw with TARP, or the budget deal earlier this year, it’s almost always bad news for taxpayers when the Evil Party and Stupid Party agree on something. P.P.S. Here’s a good link if you enjoy anti-politician jokes. Gotta agree with the comment that its always bad when the stupid party and the evil party agree. Could we please get back to some good old Washington DC Gridlock? Seems to me that’s when our economy and our citizens do the best. Plus the fact that it gives the media something to write about.